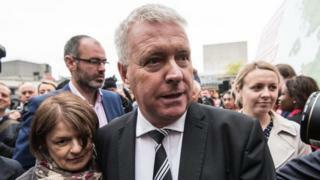 Labour chairman Ian Lavery offered to resign from the shadow cabinet after twice defying party orders to vote in favour of a new Brexit referendum. Labour ordered its MPs to vote in favour of a "confirmatory referendum" on a Brexit deal, but Mr Lavery abstained. His Wansbeck constituency voted 56% in favour of Leave in the 2016 referendum. Labour sources confirmed Mr Lavery's offers of resignation were both turned down by Jeremy Corbyn. In March, the House of Commons had eight "indicative votes" on alternatives to Theresa May's Brexit deal. Holding a confirmatory referendum on any deal - which was proposed by Labour's Dame Margaret Beckett - was rejected by 295 votes to 268. Mr Lavery did not vote. On 1 April, MPs voted again, this time on four alternative plans. A confirmatory referendum, this time proposed by two Labour MPs, was rejected by 292 votes to 280. Mr Lavery again defied the whip and abstained. It's understood Mr Lavery has made his opposition clear in shadow cabinet to the idea of holding a confirmatory referendum on any Brexit deal. Instead, he has argued that policy - as agreed at the 2018 Labour conference - was for a referendum only to be an option if the alternatives were no deal, or a Conservative Brexit that Labour believed was damaging. When approached for comment, Mr Lavery said conversations between him and Mr Corbyn and within the shadow cabinet were private, but that his feelings about another referendum were well-established and reflected in the Commons votes. Mr Lavery has been an MP since 2010 and party chair since 2017. How did my MP vote on Brexit indicative votes?